Lots of news and good reads from around the neighborhood this weekend and we’d like to start by presenting a tool that we hope can help with the process of sorting through it all. Dave Winer, a visiting scholar at NYU Journalism and a pioneer in all things digital, has developed an aggregator of East Village blogs. It’s another way, thanks to Mr. Winer’s good offices, that we’ve added a little more value to the local blogosphere. Here is his post on how it works and why he built it. In other neighborhood news, EV Grieve has posts about the shuttering of Bull McCabe’s back garden and compelling images of a pedestrian who was struck by a car on Third Avenue Saturday night. We’d like to remind you that the State Liquor Authority (SLA) and Department of Consumer Affairs (DCA) Licensing Committee is convening tonight at 6:30 at 200 East Fifth Street (at Bowery). 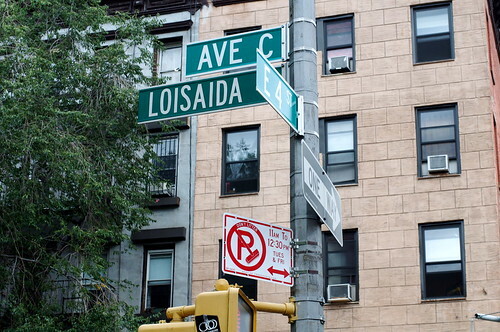 This committee, a part of Community Board 3, which covers the East Village, Lower East Side and parts of Chinatown, makes recommendations regarding appeals for new liquor licenses as well as renewals, alternations, transfers and upgrades. We’d also like to call your attention to some comprehensive community board reporting about both the East and West Village on the Eater blog. There’s a nice neighborhood-related read from Saturday’s Times by Colin Moynihan about one artist’s very distinctive tag. And with the news that another store was forced to close over the weekend because of bedbugs, we’d like to renew our call for your stories about the critters in the East Village. 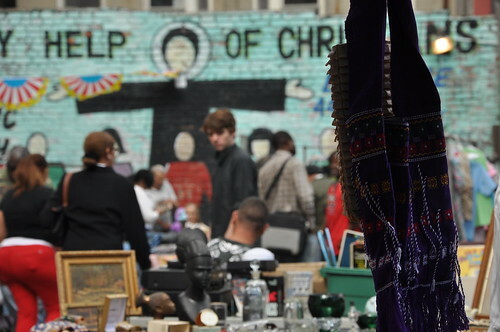 Strong images of the East Village here and here and the above photo, by community contributor Amanda Schupak, is a shot of the Mary Help of Christians flea market, which re-opened this weekend at Avenue A and 11th Street and was also covered by EV Grieve and others.